Do you ever just need to reconnect with God, remind yourself of the truth of Who He is, or reignite your personal worship time with Him? I’ve found that revisiting and singing aloud some of these classic old songs can bring me into His presence and back at His feet again. Last week I wrote about Five Old Songs I Never Want to Forget, and this week, as promised, I am sharing with you “Five More Old Songs We Can’t Forget.” I hope they encourage your heart as much as they’ve encouraged mine. “In the Garden” – a glimpse of the intimacy that is possible with God. One of the most beloved songs that celebrates the relationship of God with man is C. Austin Miles’ “In the Garden.” He starts by singing I come to the garden alone, While the dew is still on the roses and His last stanza begins with I’d stay in the garden with Him Though the night around me be falling…. The precious chorus speaks of an intimacy that we all long to have with our Maker: And He walks with me, and He talks with me, and He tells me I am His own, And the joy we share as we tarry there, None other has ever known. Do you long to know God intimately like that? This song reminds us that sweet intimacy with God can be ours…we just need to make the time to come to the garden alone and listen for His sweet voice. 2. “Come Thou, Fount of Every Blessing” – a song to keep us in perspective and on guard. When you think of your blessings today, do you think of material possessions? Your house, a nice car to drive, a great job? Do you think of your family, children, loved ones? This hymn writer thought of his salvation, God’s love, and streams of mercy, never ceasing. When we consider what we have in Christ Jesus, it brings perspective to our lives and also makes us want to value and protect our relationship with Him above anything else. We all need to be reminded of our soul’s tendency to wander, and our need to be tethered tightly to our Savior. This hymn’s powerful third verse rings through my mind often as a constant spiritual self-check: Prone to wander, Lord, I feel it, Prone to leave the God I love; Here’s my heart, O take and seat it; Seal it for Thy Courts above. What if you and I sang that line as a prayer and plea to God each morning? How we might live differently! 3. “The Old Rugged Cross” – a reminder of the power of the atonement. Who – other than Christ-followers – would sing so affectionately about an instrument of execution? Yet the cross upon which Jesus died – this emblem of suffering and shame – is what writer George Bennard says he’ll cherish till my trophies at last I lay down. I will cling to the old rugged cross, and exchange it some day for a crown. We seldom hear talk today about picking up our cross and following Jesus. We’d rather talk about the good things that happen once we come to Christ – like abundant life, eternal life, and finding your purpose in life. Talk of the cross is uncomfortable. Convicting. Shameful. But Scripture says “For the message of the cross is foolishness to those who are perishing, but to us who are being saved it is the power of God” (1 Corinthians 1:18). Look at the rich theology in the lyrics of “The Old Rugged Cross” and you may find yourself cherishing it and clinging to it, as well. 4. “All That Thrills My Soul is Jesus” – a decree that He is the Only One who satisfies. Today it’s easy to get sidetracked with what this world promises will satisfy. Long before Mick Jagger and Keith Richards of The Rolling Stones wrote “I Can’t Get No Satisfaction,” Hymn writer Thoro Harris penned this song letting us know where true satisfaction really lies: Who can cheer the heart like Jesus, by His presence all divine? True and tender, pure and precious, O how blest to call Him mine! The fourth stanza celebrates the result of finding our delight and satisfaction in Jesus: Every need His hand supplying, Every good in Him I see; On His strength divine relying, He is all in all to me. Do you find that Jesus is the Only One who satisfies? Are you delighting in Him as your heart’s desire (Psalm 37:4)? 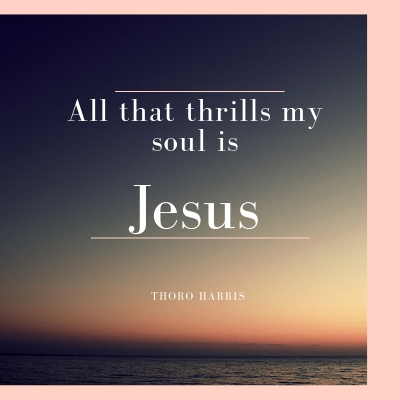 Sing a few stanzas of this old hymn until these words become your heartfelt plea: All that thrills my soul is Jesus, He is more than life to me. And the fairest of ten thousand in my blessed Lord I see. 5. “Great Is Thy Faithfulness” – a song of gratitude and praise. This hymn by Thomas Chisholm reminds us of God’s great faithfulness that is new every morning (Lamentations 3:22-23). As we sing it we proclaim there is no shadow of turning with Thee; Thou changest not, Thy compassions they fail not, As Thou hast been, Thou forever wilt be. How often we need the reminder that All I have needed Thy Hand hath provided. God is still faithful even when we are not. His faithfulness extends to not just our daily provision but our eternal provision as well: Pardon for sin and a peace that endureth, Thy Own dear presence to cheer and to guide; Strength for today and bright hope for tomorrow, blessings all mine with ten thousand beside. We need to remember this hymn simply because it keeps us humble, grateful, and constantly aware that every good and perfect gift comes from our Father above (James 1:17). on Five More Old Songs We Can’t Forget. As usual, my favorite author has hit the nail squarely on the head! Thank you for such beautiful and humbling reminders of different ways to worship!